Hayes & Yeading United put up a fine performance to progress to the fourth qualifying round of the F.A. Cup thanks to a single goal by defender Tom Cadmore, his first for the club. And had it not have been for the heroics of Chelmsford City goalkeeper Danny Gay, the winning margin would have been larger. An experienced visiting sidesent a warning shot across United's boughs in the third minute when Kezie Ibe flicked on from Gay's long free kick and skillful winger Ricky Holmes volleyed over the bar. 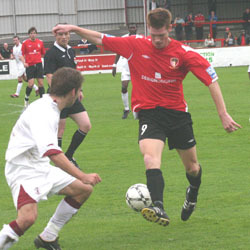 But within a minute, United's reposte was orchestrated by Will Hendry's surging run through the middle. He slipped the ball through to Staforde Palmer whose shot was charged down by the onrushing Gay. United were allowed quite a lot of possession as the visitors sat deep and began to assert their authority on the game. On 9 minutes, captain Nevin Saroya rose highest to power a header towards goal but Gay put up a hand to tip it over. Two minutes later, a penalty was awarded when Hendry's ball found Simon Martin who cut the ball back to Staforde Palmer and the 19 year old was tripped by Gay. Hendry's firmly struck spotkick was however, straight at Gay. Hayes & Yeading continued to enjoy the majority of possession and looked the most threatening, with Steve Perkins pulling the strings from deep and the defensive trio of Cadmore, Saroya and Peter Collins looking in a partuicularly stubborn mood. A fizzed cross by Bertie Brayley right across goal did cause a few hearts to flutter, but otherwise, there was little threat on Delroy Preddie's goal in the first half. 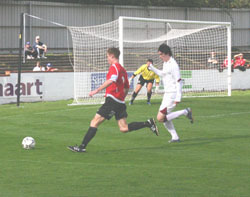 In fact, Toby Little came close to breaking the deadlock for United with a firm shot which Gay did well to pat away. At the beginning of the second half, a Spencer Knight cross was met by the head of Chelmsford capatin Jeff Minton, and his looping header had to be watched carefully into his hands by Preddie. United were soon on the attack again though and after a throw in by Little to Staforde Palmer was moved on quickly, Liam Collins hit a shot which was deflected by Spencer Knight onto the post and into the grateful arms of Gay. Andy Duncan was just wide from former Yeading player Lee Protheroe's corner but play quickly switched to the other end as Little shot into the side netting from a good position. The only goal of the game was soon to come. 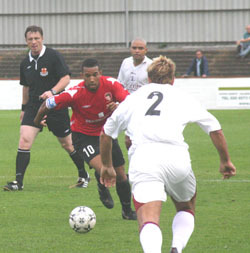 After Cadmore had caused confusion in the Chelmsford defence with an accurate ball forward, leading Duncan to head behind for a corner, he then met Hendery's corner with a firm header in off the bar, despite Stuart Ainsley's best attempts to scramble the ball off the line. Despite their need to go searching for an equaliser, United continued to put Chelmsford on the back foot and almost immediately, Staforde Palmer thought he'd doubled the lead but for Duncan to deflect his shot just wide of the post. Then moments later, with the City defence appealing for offside, Danny Allen-Page bore down on goal but Gay first whipped the ball from under his feet and then smothered his shot. Gay then denied Staforde Palmer again as United really cranked up the pressure. Towards the end, Chelmsford began to find their feet again and Jamie England's goalbound drive was hacked clear by Peter Collins. It was injury time when their biggest chance fell to Brayley after Protheroe found him in space but his shot went a whisker wide of the far post. 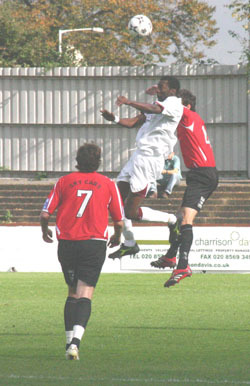 But before the end of the game, the visitors' Kamikaze tactics allowed gaping holes to appear in their defence. Hendry, Kieran Knight and Staforde Palmer were all denied in one on one situations by Gay who quite clearly didn't deserve to finish on the losing side.